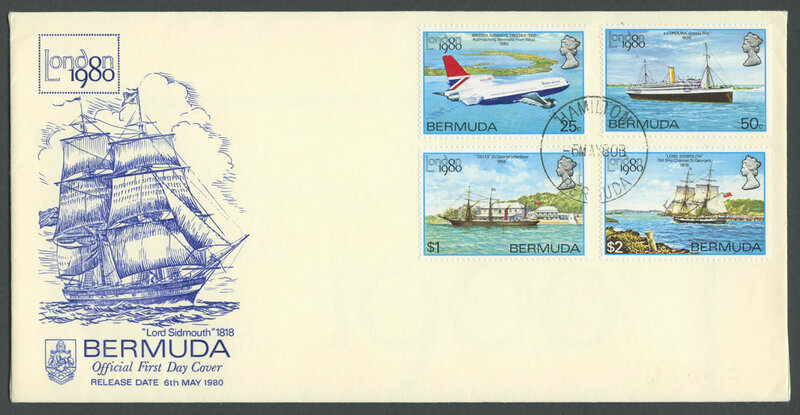 Stamps: Bermuda 15c 1984 375th Anniversary of Settlement miniature sheet; 40c 1973 Lawn Tennis Centenary 24c; 50c 1983 Bicentenary of Manned Flight 12c; $1 1976 Tall Ships Race 17c. 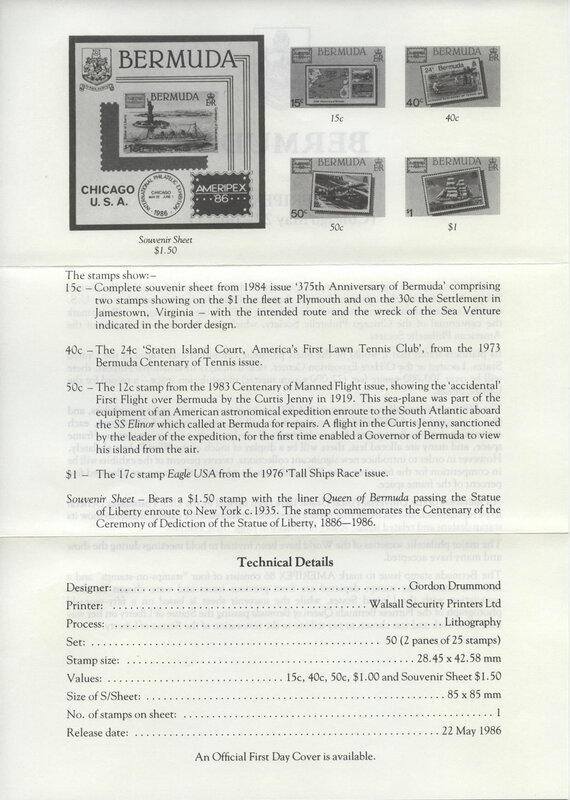 Miniature Sheet/Souvenir Sheet: MS533 80x80mm $1.50 Statue of Liberty and Monarch of Bermuda. 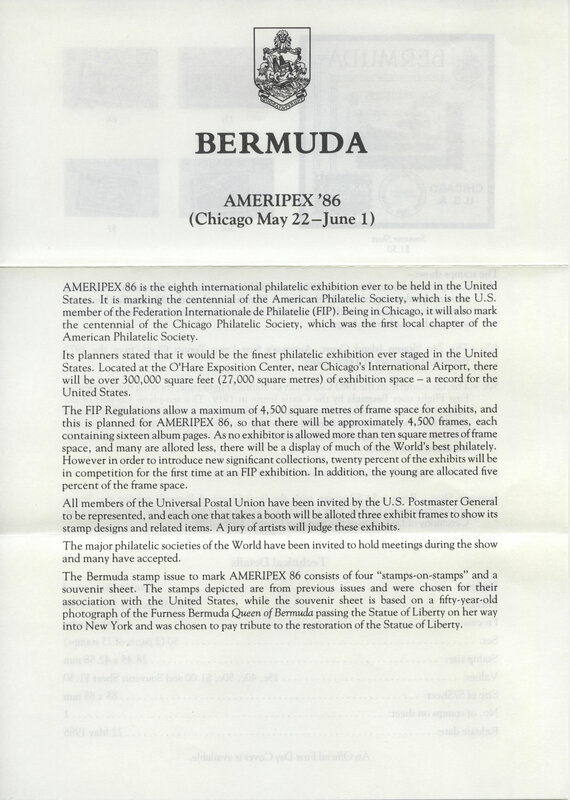 AMERIPEX 86 is the eighth international philatelic exhibition ever to be held in the United States. 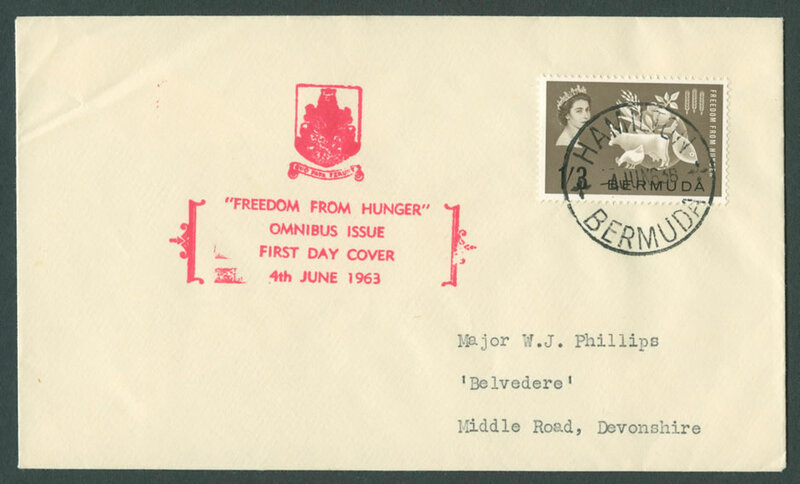 It is marking the centennial of the American Philatelic Society, which is the U.S. member of the Federation Internationale de Philatelie (FIP). 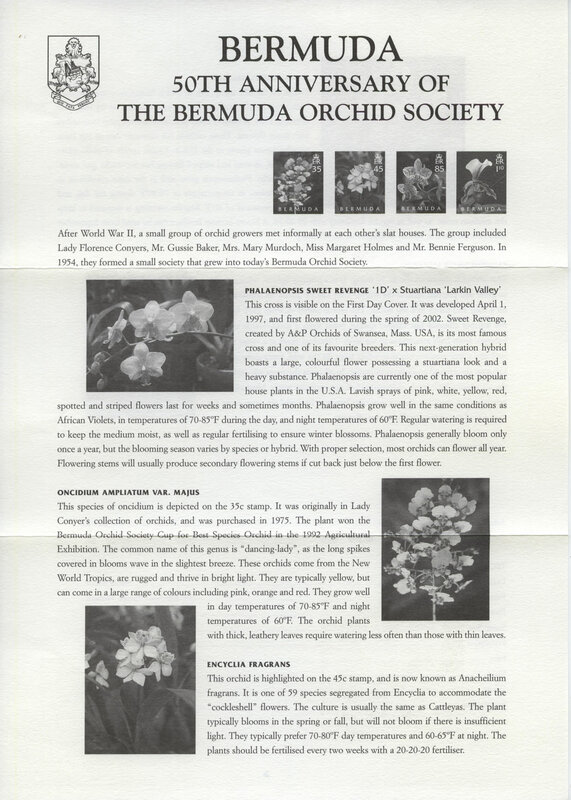 Being in Chicago, it will also mark the centennial of the Chicago Philatelic Society, which was the first local chapter of the American Philatelic Society. 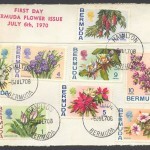 Its planners stated that it would be the finest philatelic exhibition ever staged in the United States. Located at the O’Hare Exposition Center, near Chicago’s International Airport, there will be over 300,000 square feet (27,000 square metres) of exhibition space – a record for the United States. 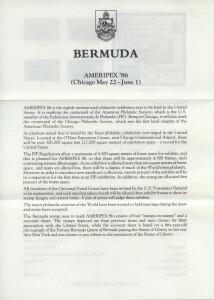 The FIP Regulations allow a maximum of 4,500 square metres of frame space for exhibits, and this is planned for AMERIPEX 86, so that there will be approximately 4,500 frames, each containing sixteen album pages. 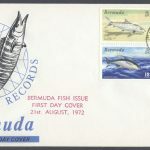 As no exhibitor is allowed more than ten square metres offrame space, and many are alloted less, there will be a display of much of the World’s best philately. However in order to introduce new significant collections, twenty percent of the exhibits will be in competition for the first time at an FIP exhibition. In addition, the young are allocated five percent of the frame space. 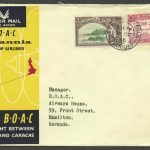 All members of the Universal Postal Union have been invited by the U.S. Postmaster General to be represented, and each one that takes a booth will be alloted three exhibit frames to show its stamp designs and related items. A jury of artists will judge these exhibits. 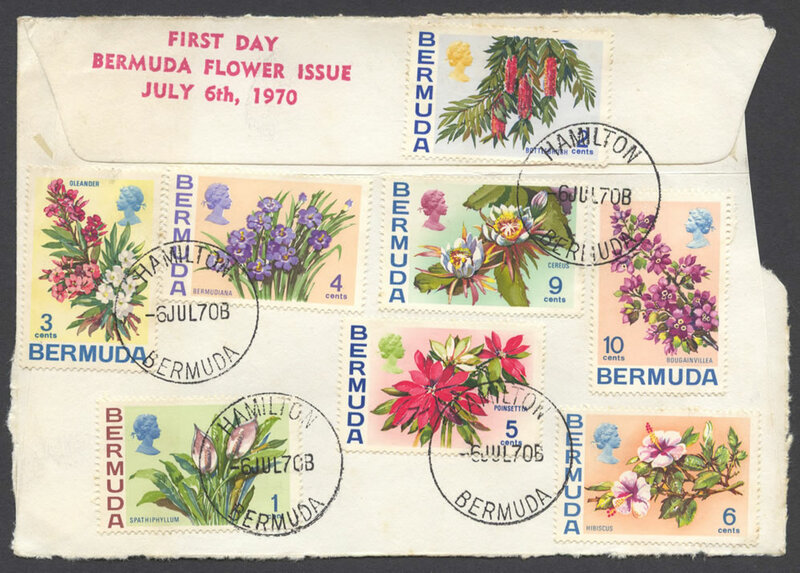 The major philatelic societies of the World have been invited to hold meetings during the show and many have accepted. 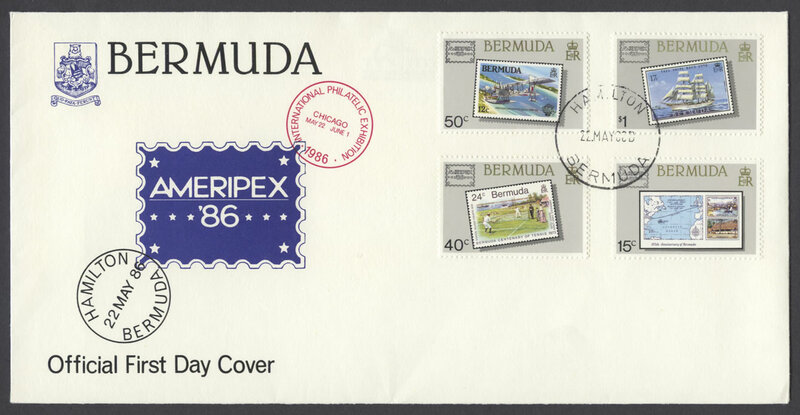 The Bermuda stamp issue to mark AMERIPEX 86 consists of four “stamps-on-stamps” and a souvenir sheet. 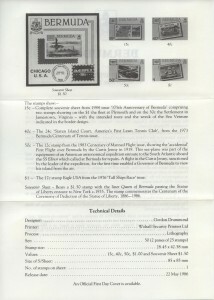 The stamps depicted are from previous issues and were chosen for their association with the United States, while the souvenir sheet is based on a fifty-year-old photograph of the Furness Bermuda Queen of Bermuda passing the Statue of Liberty on her way into New York and was chosen to pay tribute to the restoration of the Statue of Liberty. 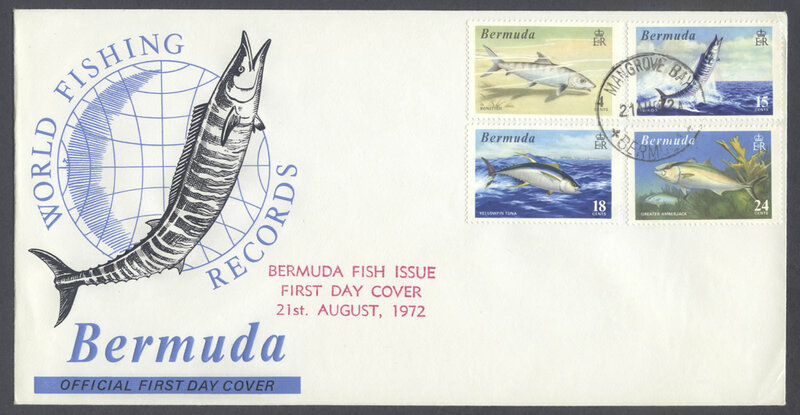 15c – Complete souvenir sheet from 1984 issue ‘375th Anniversary of Bermuda’ comprising two stamps showing on the $1 the fleet at Plymouth and on the 30c the Settlement in Jamestown, Virginia – with the intended route and the wreck of the Sea Venture indicated in the border design. 40c – The 24c ‘Staten Island Court, America’s First Lawn Tennis Club’, from the 1973 Bermuda Centenary of Tennis issue. 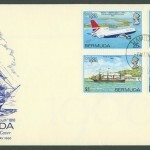 50c – The 12c stamp from the 1983 Centenary of Manned Flight issue, showing the ‘accidental’ First Flight over Bermuda by the Curtis Jenny in 1919. 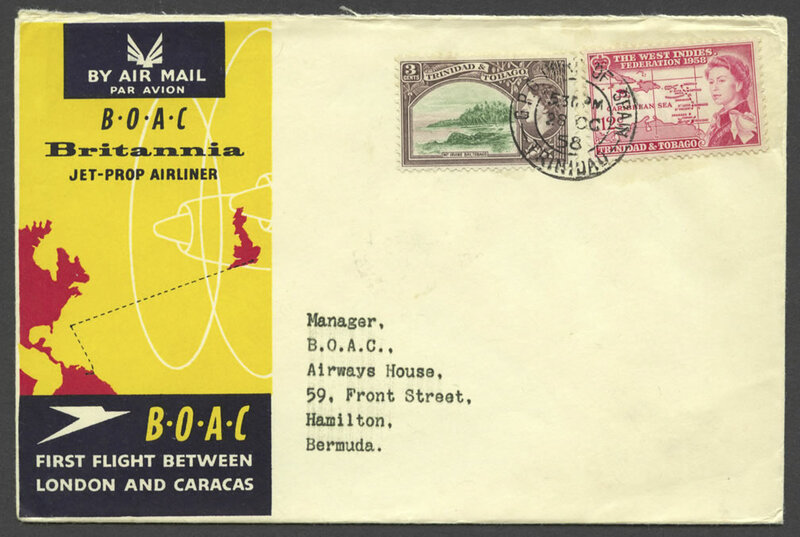 This sea-plane was part of the equipment of an American astronomical expedition enroute to the South Atlantic aboard the SS Elinor which called at Bermuda for repairs. 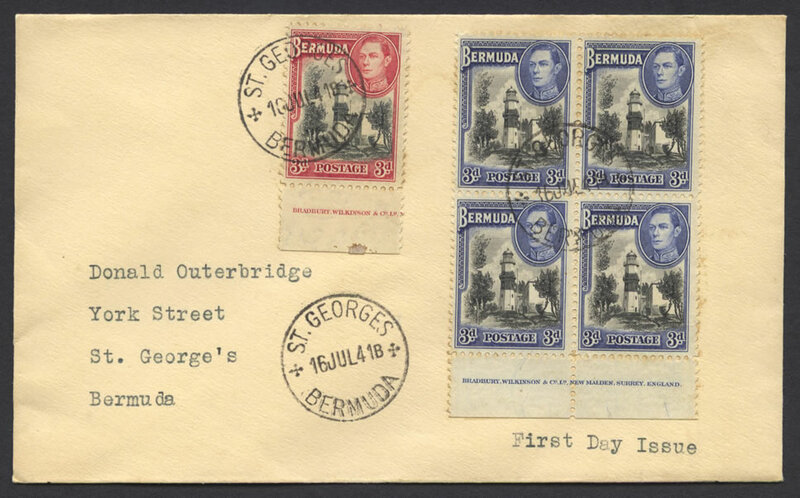 A flight in the Curtis Jenny, sanctioned by the leader of the expedition, for the first time enabled a Governor of Bermuda to view his island from the air. 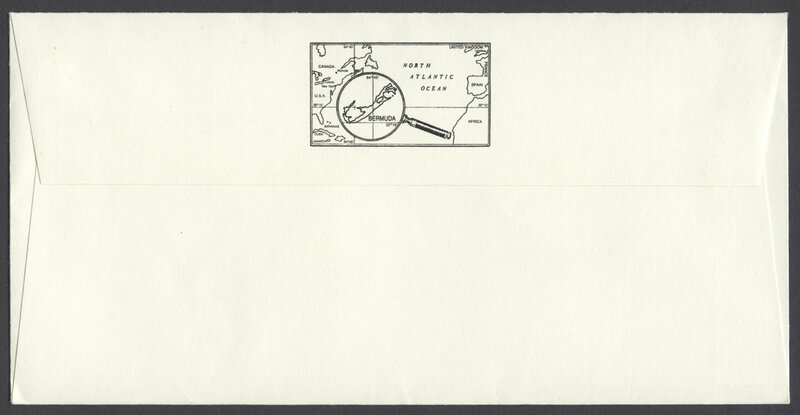 $1 – The 17c stamp Eagle USA from the 1976 ‘Tall Ships Race’ issue. 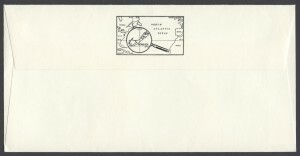 Souvenir Sheet – Bears a $1.50 stamp with the liner Queen of Bermuda passing the Statue of Liberty enroute to New York c.1935. 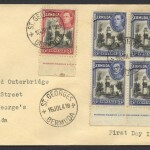 The stamp commemorates the Centenary of the Ceremony of Dediction of the Statue of Liberty, 1886-1986. 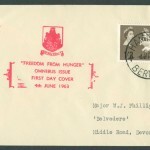 An Official First Day Cover is available.